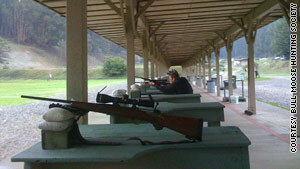 Members of the Bull Moose Hunting Society hone their skills at the Chabot Gun Club in Castro Valley, California. Member tells critics, if you eat meat, might as well "get your hands dirty"
(CNN) -- It was at a barbeque in San Francisco's Mission District that Nick Zigelbaum asked Nick Chaset the question that led to a lot of shooting. "He had this leg of a whole animal in his mouth, and I asked him [where] had he gotten this meat," Zigelbaum said. "And he said that he had shot it that day, so immediately I was intrigued." The topic was not typical for a soiree in the ethnically and culturally diverse neighborhood in a famously liberal urban area. But that conversation some two years ago led to a hunting trip and, later, to the Bull Moose Hunting Society -- a club that aims to get urbanites into the wild and in touch with their primal instincts. "You live in San Francisco, or you live in another big urban city, there's not much access to wild areas, and it's hard to find people who hunt," Zigelbaum said. "It's hard to find people who will mentor you." Earlier this year, the two said, the club -- named after the Bull Moose Party of President Teddy Roosevelt, an avid outdoorsman -- had about 25 members, and another 50 had an interest in joining. Keeping more with the California city's image, the group has a strong environmental focus. "Leave no trace" is a motto from their mission statement. And their usual prey of choice is the feral pig, an invasive species descended from domesticated pigs brought by Spanish settlers. "Had wild boar not been such an obvious first animal, had it not been such a good thing for the state as whole, I don't know if we would have both jumped on it like we did," Zigelbaum said. The Bull Moose Hunting Society also emphasizes respect for its prey, exhorting members to strive for a clean shot and a quick, less painful death for the animal. Chaset is now a graduate student in Washington. Zigelbaum is a freelance consultant who works for the environmental group Natural Resources Defense Council. Both Nicks are from urban backgrounds, Nick Chaset growing up in the Bay Area and Nick Zigelbaum in Boston, Massachusetts. Neither had any real experience hunting while growing up, although both enjoyed outdoor pursuits such as hiking. At first they just planned on taking a few like-minded San Franciscans along on hunting trips. But they were quickly overwhelmed with interest. They decided that they needed a structure to help people get the information and mentoring they needed to go hunting. Chaset said the hunting-food connection is his main response when fellow urbanites question the humanity of hunting. "I'll respond, 'Do you eat meat?' and the vast majority say, 'Yes, I do,' " he said. "I say, 'Well, you know, every animal you eat died. Somebody killed it. You might as well experience it for yourself. You might as well get your hands dirty.' "
Despite the group's hometown, the founders go out of their way to avoid political stands. They take a neutral stance toward the National Rifle Association, which reached out to them to do an interview for one of its publications. They declined. The pair says they personally support some of the NRA's programs, like gun-safety courses, but disagree with what they consider extreme views on gun control and other issues. But some members of their group are also NRA members. "Gun ownership is a complicated issue, and being extreme in one direction or the other doesn't help anyone," Zigelbaum said. "Over-regulation is certainly as dangerous and disconcerting as under-regulation." The NRA didn't respond to requests for comment. In the end, the Bull Moose founders say that, initial double-takes aside, their club is in some ways a quintessentially San Franciscan enterprise. "The creativity, the start-up atmosphere, the boundless venture capitol that's pouring into all sorts of different things in this city -- everyone's encouraged to try things new," Zigelbaum said. "We jokingly, in the beginning, referred to ourselves as Hunting Club 2.0. It's a group that's about an old idea and is being leveraged through new media."